Erica and I decided to meet up at Maeda Point for 1 dive (albeit it was LONG). She wanted to go check out the cave so our dive consisted of navigating to the cave, checking out the inside, and then swimming back to the exit. 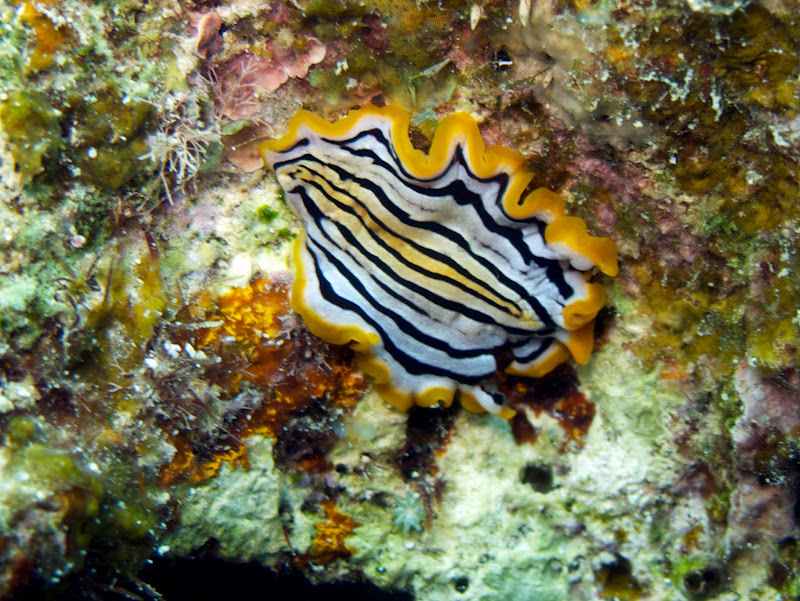 It was extremely relaxing and I managed to spot another new species of nudibranch (hooray!). 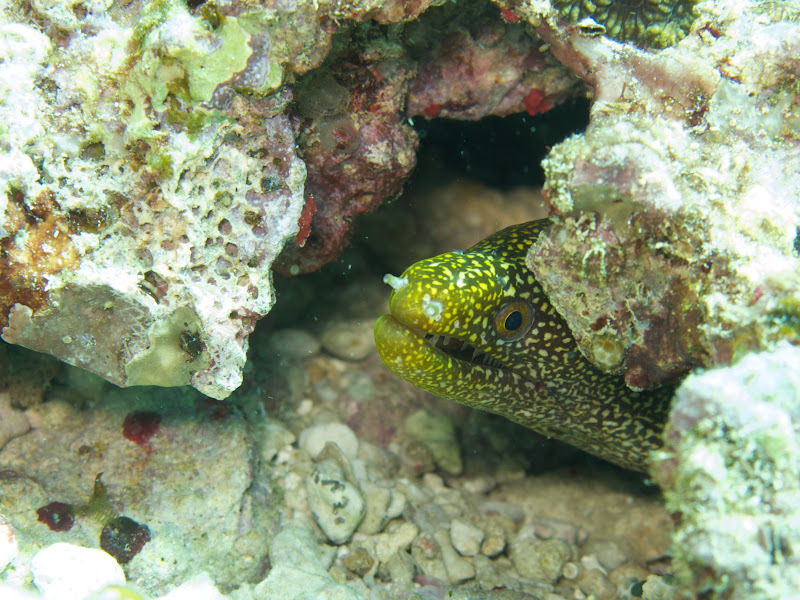 Erica also spotted a really cool looking eel tucked into the rocks. Erica lead the way towards the cave and I followed behind here. We didn’t see much until we were about 5 minutes from the cave. As I followed Erica over a small rock formation, I looked down and saw a beautifully patterned nudibranch crawling over some rubble. I hadn’t previously seen this type of nudibranch so I got very exited and instantly started taking photographs. Erica swam on ahead and managed to spot an eel so we both took tons of photos. 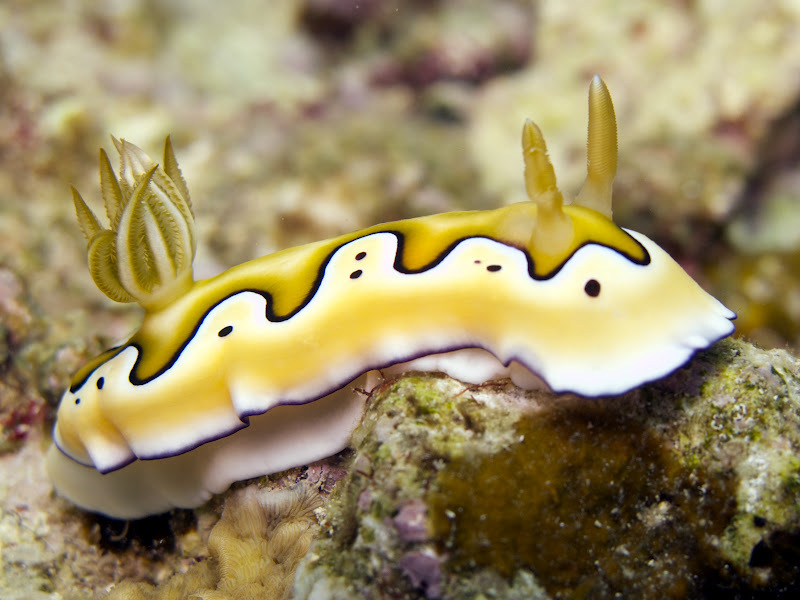 The nudibranch I saw was later identified as a Chromodoris coi. 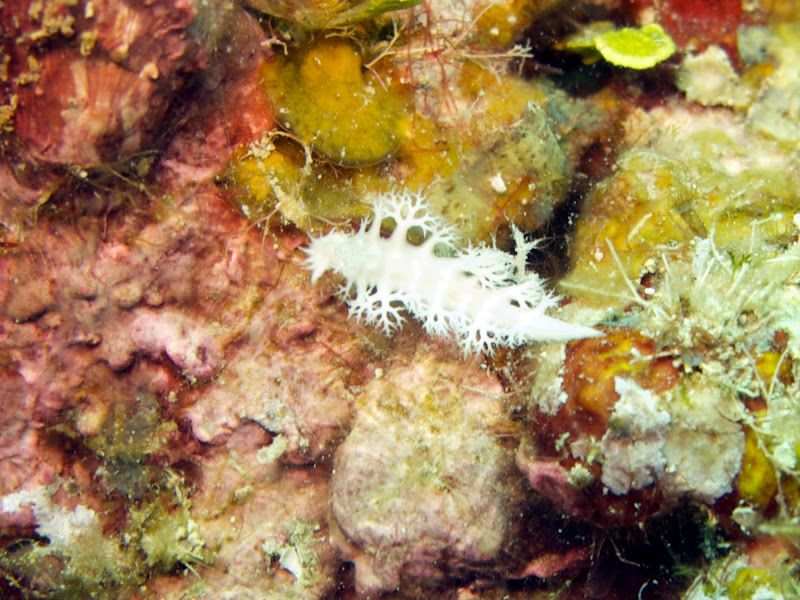 Apparently, these nudibranchs are common around Tengan Pier but rare elsewhere. 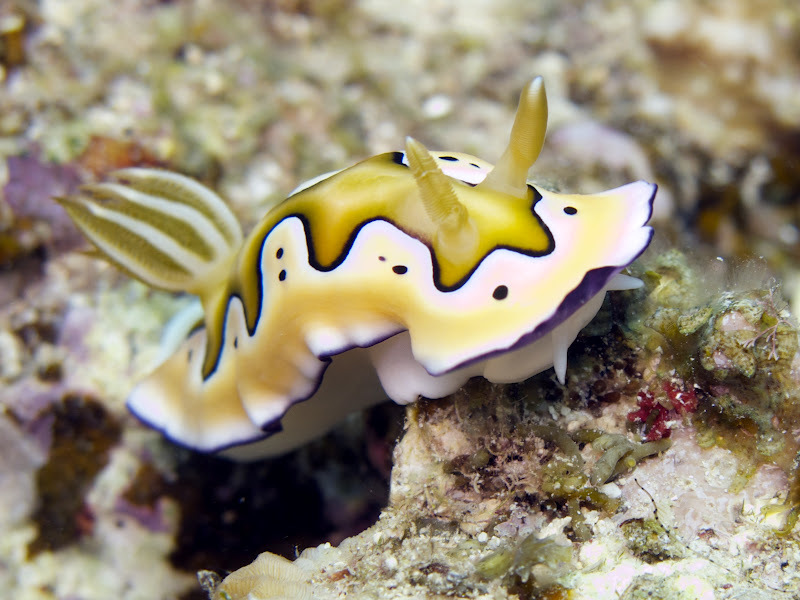 I noticed a certain behavior in the Chromodoris coi nudibranch that I had never seen before. As the coi crawled along the rocks it made a flapping motion with it’s mantle. 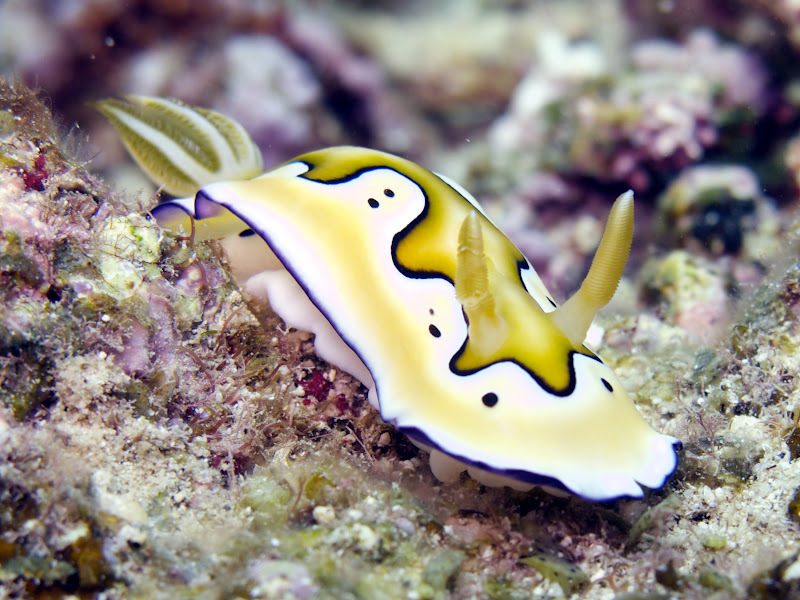 If you look in the photos I’ve posted of the Chromodoris coi, you will notice that sometimes its mantle is spreading outward and other times it seems relaxed. Not really sure what this behavior was about so if anyone knows, please share the info with me! After finishing with the Chromordoris coi (it basically moved into a position where I wasn’t able to take any more photos…boo), I swam over to where Erica had been looking in the rocks. 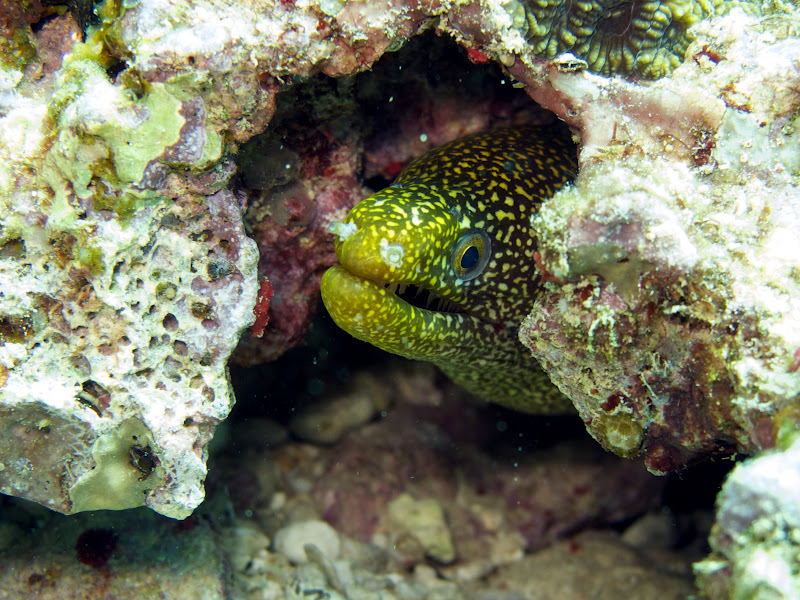 Looking back at me was some sort of eel. I think it may be a mosaic eel but I’m not to sure. It was snapping its mouth open and shut, a behavior that appears to be very intimidating but I knew it was actually just forcing water to move over its gills so it could breath. I snapped a few more photos and then motioned to Erica that I was ready to follow her into the cave. 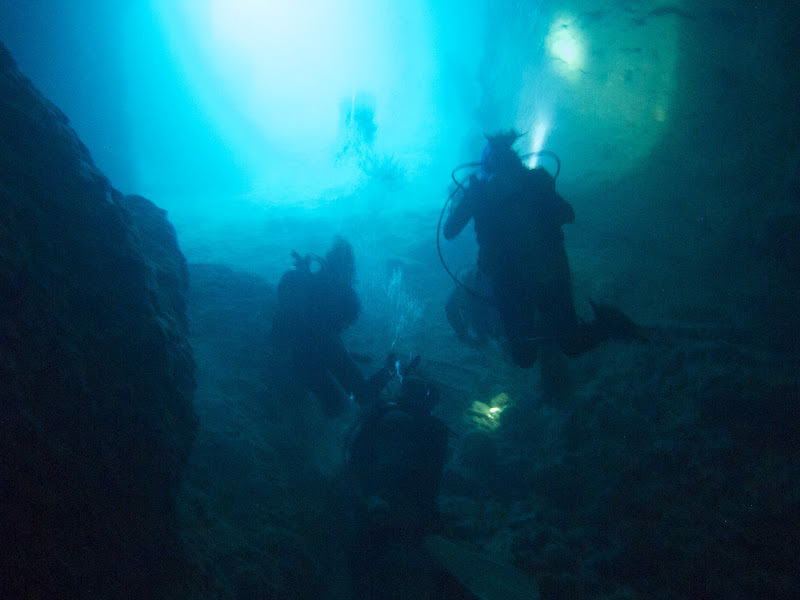 We slowly entered the cave’s opening, and Erica flipped on one of her dive lights. I followed about 5 feet behind and watched as her light moved across the barren walls. Every once and a while there would be some fish that the light would illuminate but pretty much there wasn’t a whole lot going on. We circled back after reaching the end of the cave and made out way back to the sunlight. We came across the same eel as we exited the cave. 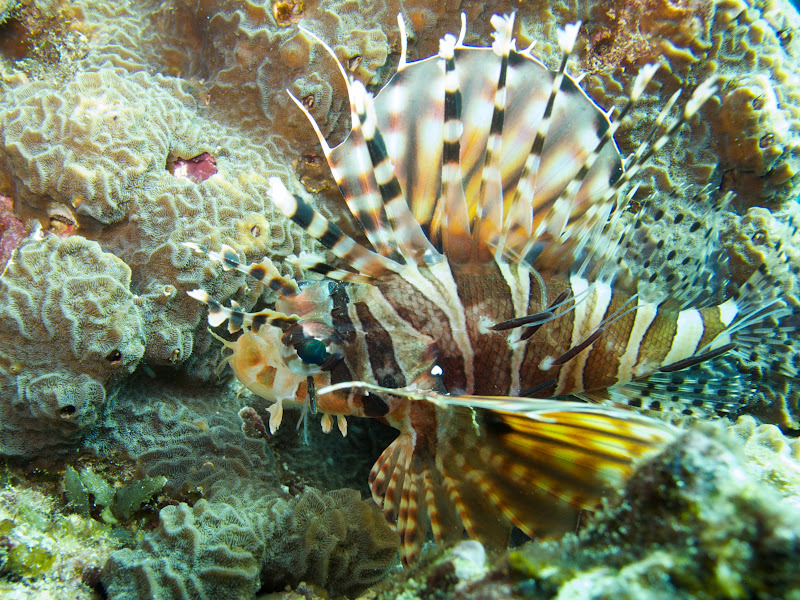 I snapped just a few more photos and then it was back out to the reef wall. I didn’t see very much of anything interesting to photograph as we kicked back so I just enjoyed the scenery. 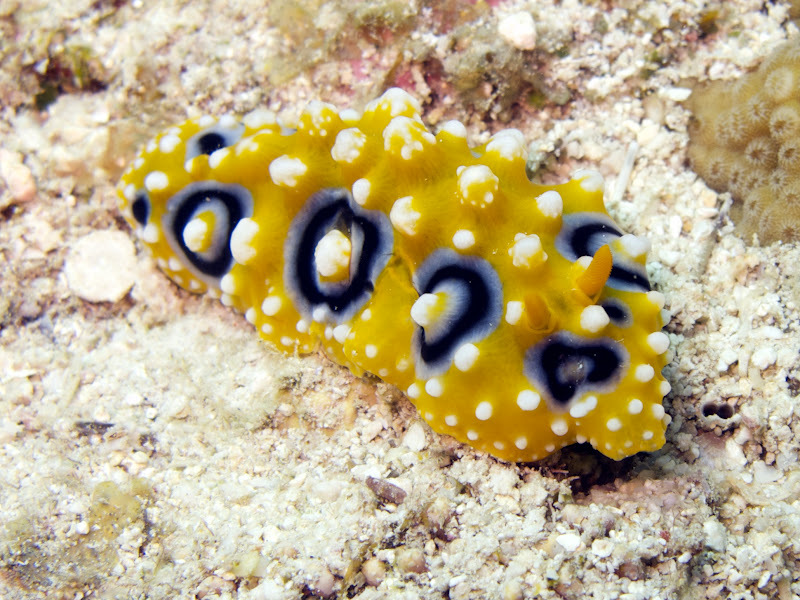 I did manage to find two nudibranchs – Tritoniopsis elegans and Phyllidia ocellata. The Tritoniopsis elegans was extremely small, perhaps only an inch in length. This made photographing it particularily difficult. If I had a macro-lens it would have turned out better, but I am cheap and don’t feel like spending a ton of money on my photography equipment. 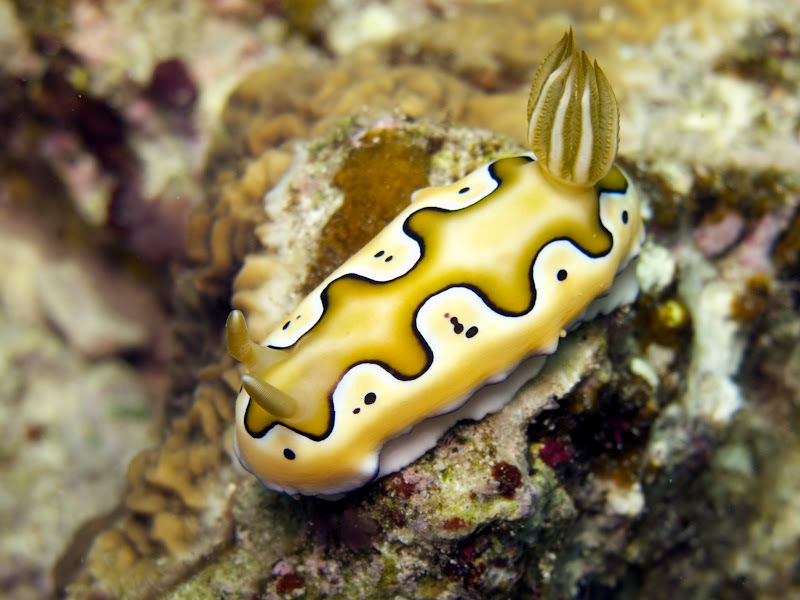 The second type of nudibranch, a Phyllidia ocellata, was much bigger in size – measuring about 2.5-3 inches in length. My photos of it turned out pretty good. I always like finding these because they are so bright and the blue circular regions really pop against the yellow. After returning to the chain we made our safety stop and I continued peering into the rocks to see if I could spot any last minute critters. I was in luck this time and saw some sort of unidentified Pseudocerotid Flatworm. I’ve seen this type perhaps 3 or 4 times previously so I was excited to spot it again. The colors are pretty neat in my opinion. I motioned for Erica to come over and take a look. She snapped a few pictures and then we made our ascent up the chain and our of the water. 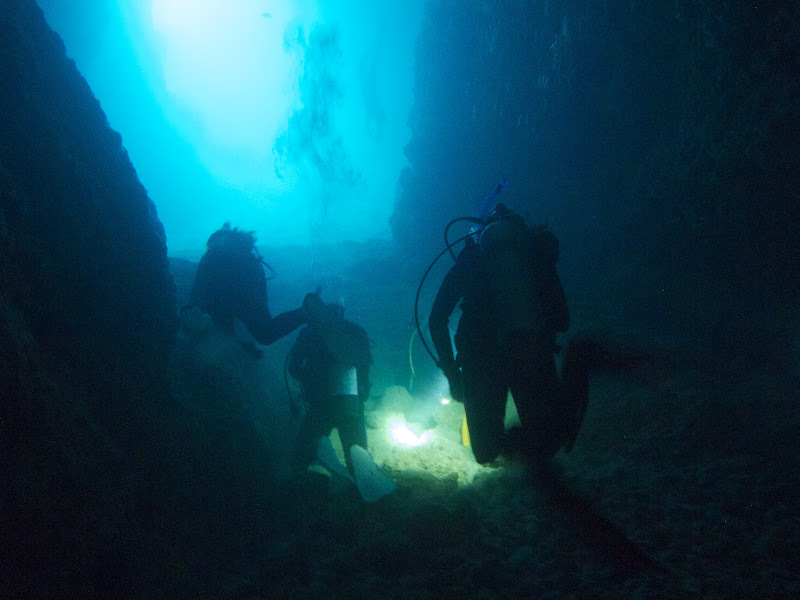 Diving with Erica was a lot of fun and Maeda Point once again provided for a great dive. 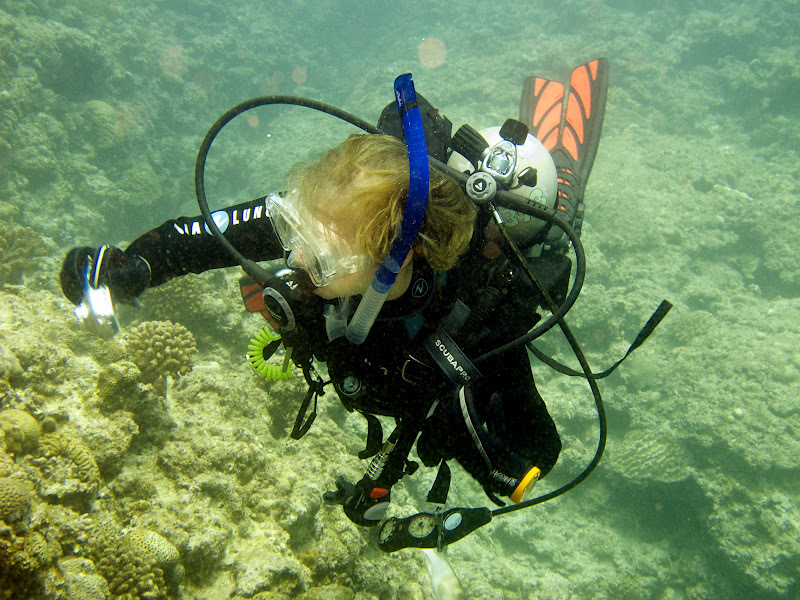 Erica is a skilled diver and does great on air consumption (something I always appreciate!) so I’m hoping to meet back up with her again!